After the qualification came to an end on Sunday, all eyes are now on the final tournament draw which will take place at the ‘Maison de la Radio’ in Paris on 12 June at 12:00 hrs. The teams that placed first in their respective qualification groups have been seeded in pot 1 and pot 2. The teams that placed second in the qualification as well as Slovenia, the best third-ranked team in the qualification, have been seeded in pots 3 and 4. Ahead of the draw, four teams have already been placed in the four preliminary round groups. Hosts France will start their campaign in group B in Nancy and would play the main round in Nantes in case they qualify. Denmark play in group A in Nantes and would also play the main round in Nantes in case they qualify. The Netherlands play in group C in Montbéliard; their main round campaign would continue in Nancy in case of a successful qualification. EHF EURO record winners (7 gold medals) Norway start in group D in Brest and would play the main round in Nancy. The final weekend takes place in the AccorHotels Arena in Paris. The Women’s EHF EURO 2018 is played from 29 November to 16 December. The final tournament playing schedule will be available immediately after the draw. One player each from four Women’s EHF EURO 2018 top nations will participate in the draw on 12 June. For Norway, goalkeeper Silje Solberg, who plays for Issy Paris Hand in France, will be present. The Netherlands are represented by Jessy Kramer; Denmark send Line Jorgensen and for hosts France Blandine Dancette will be present at the draw. Furthermore, France women’s head coach, Olivier Krumbholz, and the French Minister of Sports, Laura Flessel, will be at the draw. Since the beginning of May, individual tickets for all matches are available. For the first in Women’s EHF EURO, a ‘one match = one session’ has been established by the organising committee. Tickets can be bought via www.ehf-euro.com. Ticket questions can be directed to billetterie@EHFEURO2018.fr (general public) and billetterie.groupes@EHFEURO2018.fr (for group requests). 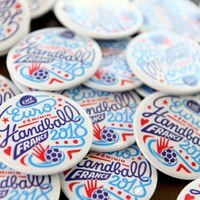 More information about the Women’s EHF EURO 2018, its host cities and venues as well as surrounding activities is available on www.ehf-euro.com.